A high-speed pursuit that started on the Bay Bridge and extended into the East Bay ended in Contra Costa County with one person being taken into custody early this morning, the California Highway Patrol said. Edgardo Chavez-Ascencion, a San Francisco resident in his mid-20s, was arrested on suspicion of DUI, reckless evading and driving on a suspended license. He was booked into jail in Contra Costa County, according to CHP Officer Vu Williams. 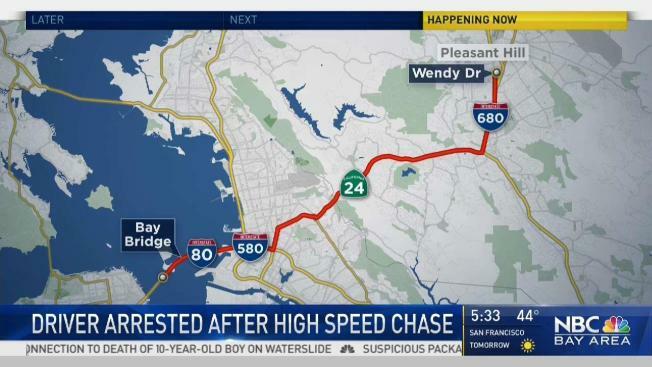 The high-speed pursuit began at 12:22 a.m. on the Bay Bridge and came to an end in the 1500 block of Wendy Drive in Pleasant Hill, according to the CHP. Chavez-Ascencion was driving a yellow van with identification from the Black Rock City Department of Public Works, which is in charge of construction at the Burning Man annual gathering in Nevada. Williams said the vehicle has not been reported as stolen and the CHP has not confirmed whether the suspect has any connection to the DPW.